Tel Aviv — June 18, 2018 — New data published in Nature Biotechnology, represents the largest ever analysis of immune cell signaling research, mapping more than 3,000 previously unlisted cellular interactions, and yielding the first ever immune-centric modular classification of diseases. 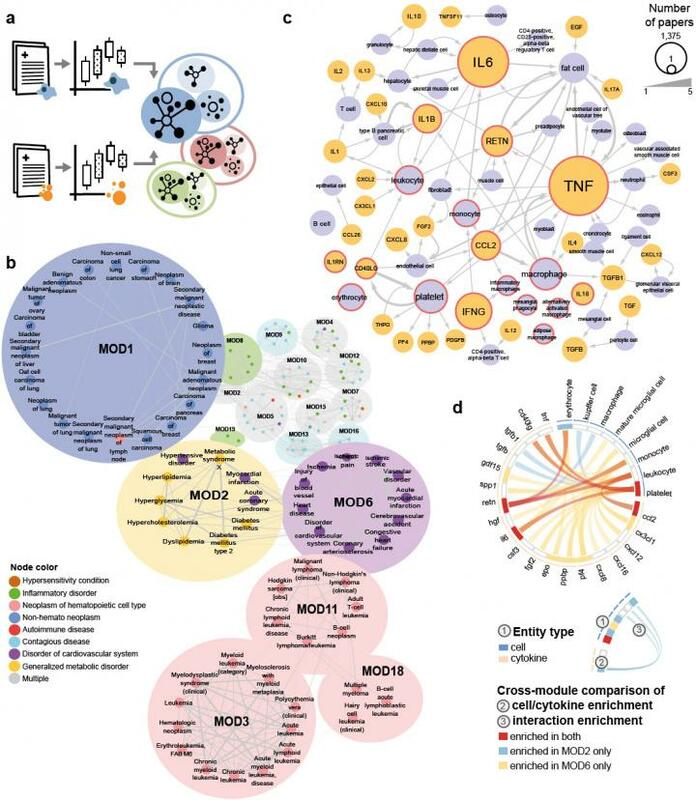 These data serve to rewrite the reference book on immune-focused inter-cellular communications and disease relationships. The immune system is highly complex and dynamic, and with a new immunology paper published every 30 minutes, there is no practical way for a human to grapple with the sheer size and diversity of the field. As this body of data grows, machine learning methods will be the only practical way of fully leveraging all the efforts being made to advance immunology and science in general. Standardizing and contextualising the full body of cell-cytokine relationships is vital in our ability to broaden immune system understanding. Based on this curated knowledge base, 355 hypotheses for entirely novel cell-cytokine interactions were generated through the application of validated prediction technologies. These alone, represent discoveries born out of a better contextual understanding of existing immune system knowledge. This potential becomes even more powerful when such knowledge can be integrated with other rich data sources and AI technologies to generate significant new clues in the fight against disease. "Given the dominant role the immune system plays in disease, an immune-centric view takes us towards a better understanding of disease mechanisms." Said Professor Shai Shen-Orr, PhD., Chief Scientist at CytoReason and Director of Systems Immunology at the Technion. "These data demonstrate that valuable, validated, predictions are possible just by mining and learning from existing papers. This ability grows exponentially when you integrate it with other prediction technologies and additional data sets." "This important piece of work changes the paradigm in what can be predicted when you interfere with a particular receptor, molecule or cell – specific to a disease or tissue. This work, combined with our Cell-Centred Model, doesn't just describe what happens between the cells etc, but also defines who initiates and who acts on it – this is the key to the uniquely 3-dimensional view of the immune system that CytoReason builds." Born out of 10 years' research from Stanford and the Technion, CytoReason is the only AI company to focus entirely on the immune system in developing its proprietary data and AI / machine-learning approach. This approach is capable of constructing 3-dimensional maps of previously hidden, immune-system relationships at a cellular, tissue and disease level. We call this the CytoReason Cell-Centered Model, and it is the key to unlocking immune system relational insights that can lead to biological discovery. Our cell-centered approach leverages public and proprietary data, proprietary technologies and methodologies, which when integrated with client data provides disease- and tissue-specific insights that can enhance discovery, shorten trial phases and reduce development costs.